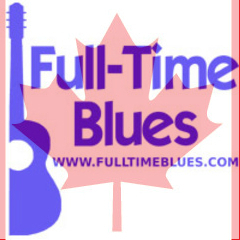 Full-Time Blues Radio is The Home for New & Independent Blues Music. The weekly show is hosted by "Johnny Full-Time" and features an hour of the best in Blues, along with Blues News and a look inside of Johnny's Mailbox - a spotlight on a new release that just arrived since the last broadcast. In addition, you never know who J.F.T. will welcome into the studio for conversation and live performance! Full-Time Blues Radio is a weekly, 59-minute radio program featuring New & Independent Blues Music. It is hosted by Johnny Full-Time, a career broadcaster, website owner, and Blues fanatic! The premise of the program is to provide a platform for the next generation of Blues legends. You can listen to any Blues show or stream and hear greats like B.B. King and Muddy Waters - and rightfully so - but, new stars must be made in order for the genre to survive, and you'll hear them here first! Johnny Full-Time also provides listeners with a weekly dose of Blues News, and a look inside of Johnny's Mailbox - a weekly spotlight on brand new music that literally hit his mailbox in the last seven days. In addition, Full-Time Blues Radio features artist interviews both in-person and over the telephone, as well as occasional in-studio performances. A blowout farewell edition of our weekly program after eight plus years of broadcasting! Great new release Blues albums covering a wide variety of the genre's different styles. New release Blues music from a mixture of established names and young superstars on the rise. New release Blues albums have their songs filling this week's playlist, representing a broad variety of Blues styles. Big time new release Blues music, and a couple crossovers by Country artists, populate this week's playlist. This week features a ton of top tier new releases, and an unintentional slant toward harmonica Blues throughout most of the program.